Cordless impacts become stronger, smaller, lighter, and better in just about every way with each new release. Because of this, Manufactures are looking for new ways to make their impact bits and accessories strong enough to be able to handle all the extra torque. Bosch has just announced their brand new line of accessories specifically designed with the power of impacts in mind. 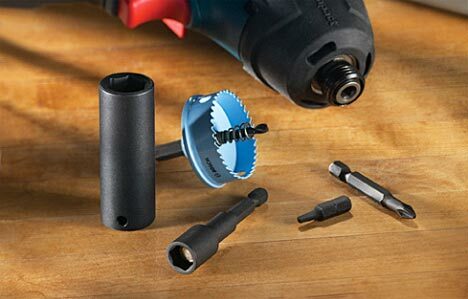 The Impact Tough Line includes Insert Bits (Phillips, Square, and Torx), Power Bits (Phillips, Square, and Torx), Nut Setters ( 1/4” to 7/16”) and Sockets & Socket Adapters (5/16” to 15/16” socket outputs, 3/8” and 1/2” square drives). The Impact Tough screw driving bits are not only built with stronger tips, but also include something called torsion zone, which helps absorbs some of the torque during high loads. The new Nut Setters feature a larger brass N43 neodymium magnet that is said to last longer and offer better holding power then traditional nut drivers. Bosch will also introduce a family of Impact Tough Hole Saws that are designed for fast clean cuts through metal. The new Impact Tough accessories will first hit stores in two bulk sets. The first being a 30-piece General Purpose Impact Screw Driving Set (18 insert bits, 7 power bits, 1 bit holder, 3 nut setters and 1 socket adapter) and the second a 21-piece Insert Bit Set (20 insert bits and a bit holder). The hole saws are set to be released in various sizes early this summer. I have found that regular Bosch bits are one of the few that can last day after day in an impact driver, so these new bits should be something to look forward to.